We're finally back home in Florida (had a nice visit with our families up in KC for the holidays), back into my usual painting routine. I have a lot of exciting things planned for 2015! Among the first things I want to do is try to schedule more live painting broadcasts online through my Livestream - I'll be sure to let everybody know at least a day ahead of time so you can watch and pop in for Q&A (this time, I'm going to have Matty field questions and dictate the typing to him, so I can get more actual painting done). Other new projects through 2015 will be the remaining book character illustrations for my new Strangeling book, a lot of new Alice paintings for my Alice In Wonderland Oracle Deck, and a new focus on more surreal / magical realism paintings for my upcoming Surrealism themed Oracle Deck. I'll be getting a lot of Disney projects done this year - including a special piece for Disney's D23 (I'll be doing a signing there during D23) in Anaheim, my Take Over of Disneyland's WonderGround Gallery, and more events here at Disney World in Florida. I'll be at Dragon*Con & MegaCon, and will be returning to Kansas City for both Spectrum (in May) and for the KC Renaissance Festival. In October I'll have my primary solo show at Eight And Sand Gallery in Seattle -showcasing a new collection of paintings called "Birds and Beasties". Additional travels will have me going to Japan, UK and Europe. It should be a very busy year! Keep an eye out at myFacebook Events Page and even more importantly my website Strangeling.com to find out my schedule, updates, works in progress & more. Whew! 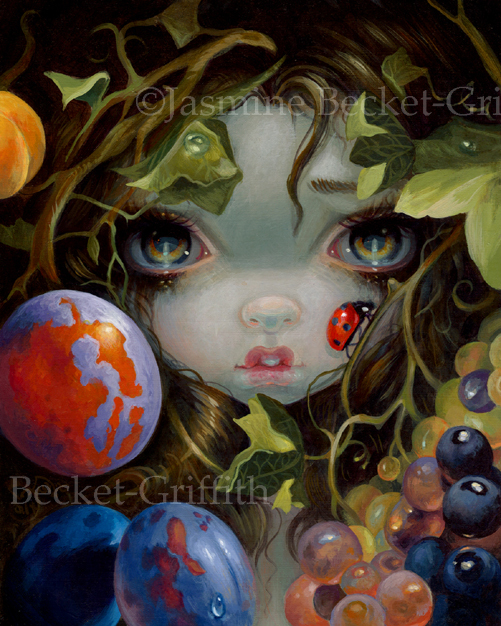 And for today, now that we're done celebrating - the three new original paintings that debuted at my Miniature Marvels show are now up on my website (the originals all sold at the Pop Gallery, but we do have prints & canvases available) - just scroll down through this update to see them all! 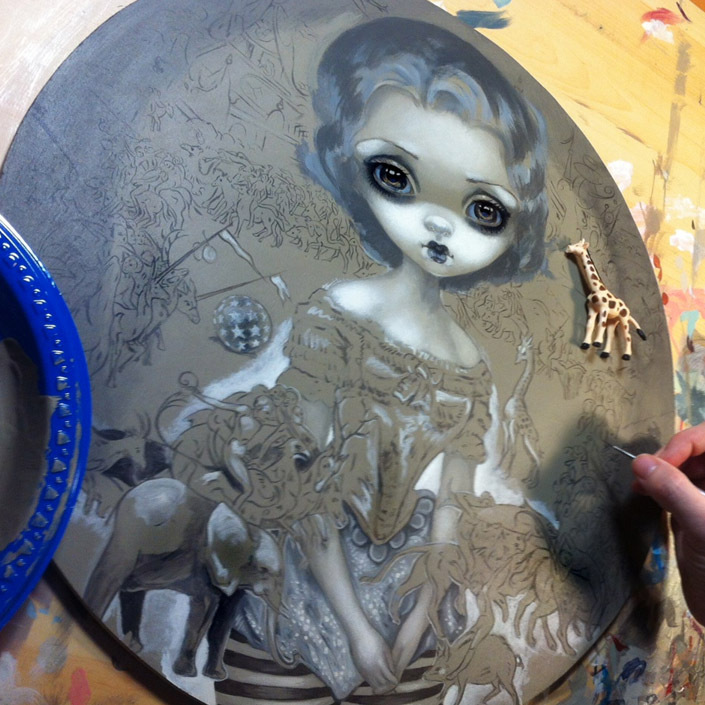 Also a great article & a work-in-progress for an upcoming group show at the Corey Helford Gallery too. And as always ALL of these glossy prints are also in my Etsy store here for you Etsy folks! Work-in-progress! 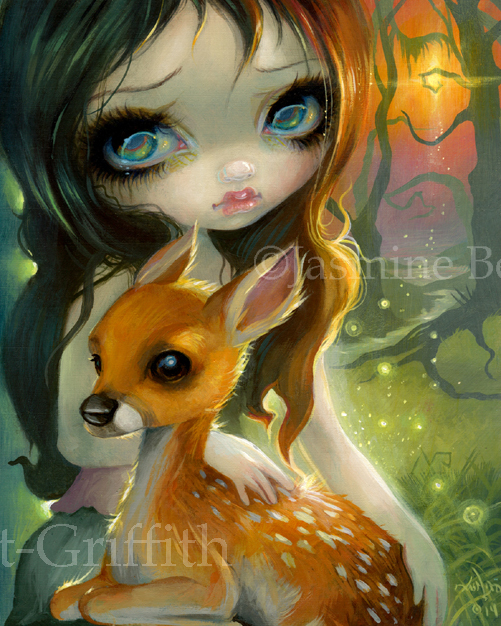 For a group show opening January 24 at Corey Helford Galleryin Culver City, CA. Early stages yet on this one - there will be an incredible amount of detail in the end. It's a circular painting with a circus theme - called "Bosch Circus" for the show "Freaks & Americana". This piece is inspired by the circus history in my own family (a troupe of aerialists from early last century known as the Flying Behees ) and of course some phantasmagorical animals and performers inspired by Hieronymus Bosch (from considerably earlier). This painting will debut at the opening reception at CHG Circa on January 24th from 7-10PM. Participating artists include: Kukula, Colin & Sas Christian, SHAG, Ron English, David Stoupakis, Michael Hussar, Tom Bagshaw, Yosuke Ueno, me of course, and many more wonderful artists. Not sure if I'll be able to make it out there in person for that evening, but definitely drop by if you can! This is an acrylic painting on panel, will be in an ornate hand-carved frame, and will be priced in the $8000 range. Prints will also be available soon! Be sure to follow me on Instagram (my ID there is Strangeling) or my Facebook to keep up with my daily updates & work-in-process photos!